Adrenal Fatigue Syndrome (adrenal fatigue) is a term used to describe a variety of symptoms related to suboptimal adrenal gland function. It is one of the most prevalent conditions, affecting almost every adult in one way or another. Adrenal fatigue is produced when your adrenal glands cannot adequately meet the demands of stress. During adrenal fatigue your adrenal glands function, but not well enough to maintain optimal homeostasis because their output of regulatory hormones has been diminished - usually by over-stimulation. Over-stimulation of your adrenals can be caused either by a very intense single stress, or by chronic or repeated stresses/illness that have a cumulative effect. Laboratory evaluation of adrenal fatigue often looks at the hormones produced by the adrenal gland (cortisol and DHEA). Adrenal Fatigue Syndrome should not be confused with Addison's disease where the adrenal glands are not functioning and is potentially life threatening. While Addison's disease is often caused by an autoimmune condition, Adrenal Fatigue Syndrome is largely caused by stress or by a host of other factors, including nervous system imbalance and metabolic-nutritional imbalances. • Lightheaded when rising from a horizontal position. • Lack of energy in the mornings and in the afternoon between 3 to 5 pm. • Need coffee or stimulants to get going in the morning. 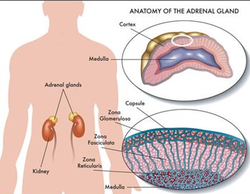 The adrenal glands also have a direct impact on thyroid and reproductive hormone levels. If the adrenal glands are weakened by stress and illness, there is often concurrent thyroid dysfunction and menstrual cycle irregularity. If you are experiencing any of the symptoms above, please contact Dr. Linda Gedeon for proper evaluation and to discuss the best treatment options for you.